FORT WORTH, Texas, April 5, 2011 /PRNewswire/ -- American Eagle, the regional affiliate of American Airlines, today launched three daily round-trip flights between Albuquerque International Sunport and Los Angeles International Airport. The new service is operated with 63-seat Bombardier CRJ-700 jets featuring a two-class cabin, as well as 44-seat Embraer jets. "We&apos;re delighted to launch our service from Albuquerque to American&apos;s cornerstone hub in Los Angeles," said Gary Foss, Vice President – Planning and Marketing for American&apos;s regional network. "With three daily nonstop flights, customers from Albuquerque will have more travel options throughout the day as well as more convenient connections to the world through American&apos;s Los Angeles cornerstone hub, and the oneworld® global network. Favored destinations include Hawaii, Hong Kong, Japan, Peru, Australia and New Zealand." One example of those increased travel options is American&apos;s new nonstop service from Los Angeles to Shanghai, which also begins April 5. The new Eagle service to and from Albuquerque is timed for convenient Shanghai connections. The new Los Angeles flights also complement existing American and American Eagle service to American&apos;s cornerstone hubs in Chicago and Dallas/Fort Worth. All this is part of a major expansion of the Los Angeles cornerstone hub that will see more than 30 flights added today to 15 communities for a total of over 150 daily flights. "This new service is a positive for both business and leisure travelers," said Albuquerque Mayor Richard Berry. "More connections to more destinations are good for the whole community and are proven economic drivers for a city." Customers can earn double miles for travel between Los Angeles and Albuquerque beginning today through June 30, 2011. To participate in this promotion, customers need to register prior to travel using promotion code LAX2X. Customers can register and obtain complete offer terms and conditions for this promotion as well as learn about our triple mile offer for travel on our new nonstop flight from Los Angeles to Shanghai at www.aa.com/morelax. If you are not yet an AAdvantage member, it&apos;s easy and free to enroll – just visit www.aa.com/enroll. With the introduction of nine First Class seats on all of its CRJ-700 aircraft, Eagle now offers a premium product with the same level of outstanding service customers experience on American Airlines. Eagle&apos;s complimentary First Class dining service on longer flights includes a continental breakfast with cereal or hot oatmeal and yogurt and a lunch or dinner that includes a fresh salad or a sandwich and dessert. First Class customers receive warm, cleansing towels and mixed nuts prior to their meals, which are served on china. On flights of shorter duration, beverage service will be accompanied by a gourmet snack mix. The new First Class seat includes four-way adjustable headrests, ergonomically-contoured back and seat cushions, together with a unique, articulated seat bottom, which allows customers to recline with less impact on the legroom of passengers seated behind them. American Eagle operates more than 1,500 daily flights to over 170 cities throughout the United States, Canada, the Bahamas, Mexico and the Caribbean on behalf of American Airlines. American, American Eagle and the AmericanConnection® airlines serve 250 cities in 50 countries with, on average, more than 3,600 daily flights. The combined network fleet numbers more than 900 aircraft. American&apos;s award-winning website, AA.com®, provides users with easy access to check and book fares, plus personalized news, information and travel offers. American Airlines is a founding member of the oneworld® Alliance, which brings together some of the best and biggest names in the airline business, enabling them to offer their customers more services and benefits than any airline can provide on its own. Together, its members serve approximately 900 destinations with more than 9,000 daily flights to 145 countries and territories. American Airlines, Inc. and American Eagle Airlines, Inc. are subsidiaries of AMR Corporation. 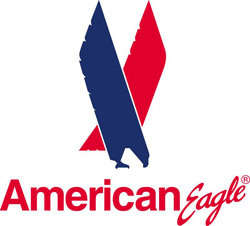 AmericanAirlines, American Eagle, AmericanConnection, AA.com and AAdvantage are registered trademarks of American Airlines, Inc. (NYSE: AMR).